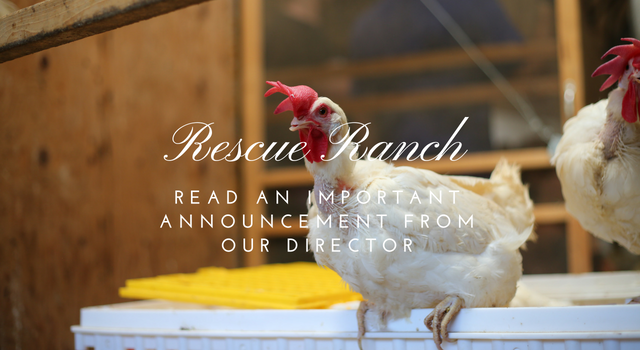 It is with mixed feelings that I announce a temporary closure of our Rescue Ranch program, as we raise much-needed funds and seek property to continue our large-scale rescue and adoption program. You are a vital part of this transition; the chickens need your support moving forward. Whether you have adopted, volunteered, helped with de-clumping or health checks, promoted us on social media, or donated to help liberated hens…I want your help to make our next steps a success. Not want…need. There are hens languishing in cages now whom all of us want to save, and I know we will with your aid. Our dream was to liberate hens from egg farms. After our move, we began fulfilling that dream and started rescuing hens directly from California egg farms. With you by our side, we have saved more than 26,000 hens’ lives through this campaign. It is the only rescue program of its kind in the country. At Rescue Ranch, we nurse the hens back to health, give them medical treatments, help them regain their strength, and then place them in forever homes through our adoption program. Unfortunately, zoning issues prevent us from continuing at our current location, and we are selling the Vacaville property. Though we are sad to have to sell this beautiful space, we have high hopes for the future. We are actively searching for new property where we can continue this one-of-a-kind, large-scale rescue and adoption program. We want to remain in the greater Bay Area, so we can reach the most people, be accessible to the public, and be an efficient home base for traveling to and from egg farms. We also see an opportunity to establish an “urban sanctuary” open for tours, events, and other educational programs. Donate: Though we are still searching for a new property, we already know it will cost a significant amount to purchase and build a peaceful sanctuary for our rescue hens. Chip in with a tax-deductible donation now and be one of the first to support our revitalized Rescue Ranch program! Promote: We understand that not everyone can give financially, but many of you wonderful supporters have emails, Facebook, Twitter, and Instagram. We will keep you updated and hope that you will spread the word about this life-saving fundraising campaign. Last but not least, I am eternally grateful to the staff and volunteers who have helped run Rescue Ranch over the years. Without them, none of it would have been possible. Special gratitude to Jan Galeazzi, Darren Roth, Blake Caraska, Marji Beach, and Kelcie Leach. Please know that our entire staff is 100 percent committed to continuing this one-of-a-kind program. We just need to find the perfect new home for it. P.S. There is a long road ahead and we will make sure to keep you updated. Our most genuine thanks for all of your support as we find a new sanctuary for our rescue hens. I have always lived in big cities. But I am very old and can remember when chickens were treated with care and affection. While I was living in San Francisco, my neighbor had three chickens as pets. She asked me if she could bring her chickens to my yard to eat the snails. Which there are many in the yards in San Francisco. Well of course I said yes. Being a city girl all my life I was greeted with the opportunity to experience these wonderful creatures. Plus I got free fresh eggs. All earths creatures are part of us and should be treated with love and respect. I agree with you 100%! Thank you for caring for these innocent victims of our ignorance! What is happening to/with the hens who are still at Rescue Ranch? How many are there? Placement for all of the remaining animals has been found, thank you! Hope you find a location near Sacramento so I can volunteer! I hope you can find adequate spaces for your chickens. I cannot contribute right now. Sorry…and best of luck! SORRY YOU ARE HAVING THESE PROBLEMS WHEN YOU ARE TRYING TO DO GOOD. BEHIND YOU 100% AND YOU CAN CONTACT ME ON EITHER E-MAIL OR FACEBOOK. BEING IN OHIO, CANT HELP WITH THE MOVE. GOOD LUCK TO YOU AND THE HENS. Take a look at Shasta County, you never know what you can find here. Affordable and a vast amount of open space. God bless you all for being the safety and love these souls deserve. Looking forward to updates and will send something when I can. Yes! I’m so proud to have brothers & sisters fighting on the battlefield for these precious animals! We’re ALL God’s children, EVEN THE ANIMALS! Take care, & ill be praying for you, your team & our brethren, the animals. I wish you were closer so I could help volunteer, being in Texas makes it a little difficult. I have seen chickens so mistreated and it never leaves my mind. I do get so tired of people saying, “but they’re just chickens” but they do feel pain like anyone else. All these precious creatures deserve to be treated with respect and care. No animal deserves to be so mistreated. I do wish I could donate to you but can’t at this time due to a serious sickness in the family. Time will come when we can for sure though and I look forward to being able to help in some way. Thank you for improving the life of so many mistreated chickens. Here in Washington state, we have changed the laws regarding battery cages and are phasing in roomier space for the hens. As far as I know, only 5 states have laws like this, I wish more would follow. Thank you for all of your efforts on behalf of all the severely mistreated/tortured hens who are enslaved in the egg production industry. So many people think “ They’re just stupid chickens”, but that’s not true. Chickens are actually quite intelligent & can also be affectionate. To those who have commented here that they want to help but can’t afford to give money …you can help by not eating chickens nor their eggs. Only by decreasing the demand for these “products “ can we ever hope to put an end to this cruelty. As long as people demand egg McMuffins & Chicken Nuggets by the hundreds of millions, then hens will be enslaved & their male chicks will be ground up alive as if they are just so much garbage. God bless you for all of your work. I wish I was close enough to volunteer or visit. All animals are Special, They are God’s Creation, They are here for Enjoyment, not to be Murdered by Cruel, Thoughtless , Money hungery Creedy People, I could say more, but I will leave it here.!!! So sorry to hear about the bump in the road, but hopefully it will lead to something even greater. I am in the Sacramento area. I have 3 pet chickens. I wanted to expand my flock with 3 more, and I wanted them to be rescue birds. Having my own birds makes me appreciate them so much and I wanted to give a few a chance to be a chicken. They are so goofy and fun! So, do you have any referrals as to how one can adopt hens who were in these egg farms? I think it’s really not possible right now. Am I right? It really angers me to read that you are being driven out of the area by legal bully laws–DISGUSTING! You have been there for eight years and it’s a 600 acre site. The powers that be could have made an exception. I’m wondering what the area is zoned for, commercial? And, if so, are they wanting to open the space for commercial business? Wishing you well with such a monumental compassionate task. Perhaps activist should have protested the city council! Hi Ann: We are sorry for the confusion (we had made a note in the article that our Grass Valley sanctuary is safe but it might be too hidden) – our 600 acre sanctuary in Grass Valley is SAFE. We are moving our facility in Vacaville to a new site in the bay Area, once funds are raised.